For 2009, Swift has dropped the single rear axle Kon-Tiki 645 and replaced it with the tag-axle 649. The new model has a rear lounge, through here there’s a central chest of drawers with flip-over coffee table as standard, with the option of a wrap-around seating arrangement for less than £100. If chosen, that would bring the on-site seating total to 16! It’s up front, though, where the Swift is really different from its most direct rival, the Auto-Trail Arapaho. Both have a pullman dinette on the offside, but where the kitchen resides in the Arapaho, the Kon-Tiki has a side-facing settee. With the swivel cab seats brought into play, that makes the front lounge even bigger than the rear one. The swivel driver’s seat is rather hidden behind the bulkhead of the rear-facing dinette bench but we’re talking maximum seating space here. And when you’re just feeding the family it’s the front lounge that makes the best dining area. The table’s slide-out extension leaf means five place settings can be squeezed in. You can split the party between adults and kids, if you wish, as there’s a full-sized free-standing table for the rear. At night, couples are most likely to use the near-instant single beds at the rear. A transverse double is the alternative choice with just a bit more effort required in its make-up (the slide-out bed bases are sturdy and easy to use). The Kon-Tiki is big in every way – long, tall, equipped with six (alloy) wheels and boasting a 5-tonne gross weight. This is not a motorhome for the faint-hearted. In a straight line it performs surprisingly well with the 3-litre engine endowed with enough torque to tow a small country behind you. More impressively, the tag-axle chassis lends this seriously big behemoth unerring stability. But then you come to a town, a junction or arrive on site and want to manoeuvre onto your pitch. Now you realise just how huge this motorhome is. Thankfully, that dash-mounted Blaupunkt sat nav (with European mapping) becomes a screen for the rear view camera as soon as you select reverse. And the cab spec also includes air-con, cruise control and two airbags. The only option you might want to add is Fiat’s semi-auto Comfort-Matic gearshift. New for this season are the 10-inch fold-down TV in the cab (with Freeview and DVD-player), LED lighting (including two exterior lights), two 110Ah leisure batteries, a new entrance door, seat bases that rise on gas struts for access to the vast storage below, heaters in both the underfloor fresh and waste water tanks, eight mains sockets and a new control panel that really is as easy to use as it is good to look at. In the kitchen, the 649 has acres of worktop space (made possible by using a removable draining board) and the modern-looking domestic-style cooker has the three gas rings, one mains hotplate, grill and oven and a microwave. Across on the offside are the bathroom and double-door wardrobe. Bathroom storage is well thought-out. The best feature is its trademark circular shower. The Kon-Tiki is superbly well equipped, looks impressive and feels very spacious – perfect for entertaining. Re-inventing the Kon-Tiki’s most classical layout in a longer body has created a real one-of-a-kind motorhome that is certain to find its market niche. 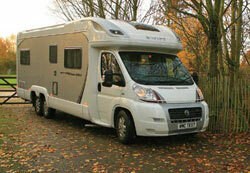 *Motorhome Insurance cost based on 2009 Swift Kon-Tiki valued at £62,807. Fitted with manufacturers immobiliser and Thatcham Category 1 approved alarm, approved tracking device, kept behind locked gates at SN4 7DP. 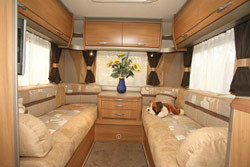 Motorhome owners – professionals 50 yrs old with no claims, convictions or health conditions in last 3 yrs. 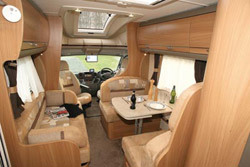 4 yrs no claims bonus mirrored from car policy + 2 years motorhome driving experience. Members of motorhome club doing less than 7000 miles/yr. £250 excess applies. EU cover £17 extra, EU Breakdown £42 extra. Premiums include insurance premium tax at 5% and are correct as of 19.01.09.